The Maremma is classified scientifically as belonging to the lupoid group (according to Pierre Megnin) As a working dog he is classed as a sheep dog. Full name Cane Da Pastore Maremmano-Abruzzese. He is a large, strongly built dog. In spite of his rustic appearance, he is at the same time majestic and distinguished, robust and courageous, with a very intelligent expression. His character is docile, but he becomes fierce when he is at work as a guardian of the flock and of his master's property. His hair is abundant, long and white. The general conformation is that of a heavy mesomorph, with the body longer than the height at the withers, harmonious as to form (heterometric), and relatively harmonious in outline (halloidism). Dolichocephalic: The total length of the head is about equal to 4/10 of the height at the withers, the length of the muzzle is less than 1/10 of the length of the cranium. The width of the skull, measured from one cheekbone to the other is rather more than half of the total length of the head, but the cephalic index should not be more than 52.5 The direction of the upper longitudinal axes of the skull and of the muzzle is slightly divergent. Overall, the head is large, shaped like a blunt wedge, and is reminiscent of the head of the polar bear. This is a very correct head. It is conical, broad with a blunt wedge shape. the length of the skull is 1/10 more than the length of the muzzle, and its width from cheek to cheek is more than half of the total length of the head; the lateral walls of the skull are therefore somewhat rounded. Seen in profile, the skull is also somewhat rounded and rather wide between the eyes; it narrows toward the facial region. Its upper longitudinal axis diverges slightly from the axis of the nasal bridge. The sinuses are not pronounced. The occipital protuberance is not accentuated. the sides of the muzzle tend to converge, but the forward part of the muzzle has a rather flat surface. The muzzle should be, in height or depth 5/10 of its length (measured at the level of commissure). The suborbital region should be rather chiselled. straight (for its length and direction in relation to the cranial axis, (see Head) Its width, measured at the midpoint should be 22% of the total length of the head, and about 55% of the length of the nasal bridge itself. the upper lips, seen from the front are shaped like a semi-circle with a very narrow chord. The lips are not high, and thus they barely cover the lower teeth; the commissure, because of the slight development of the lips, is not pronounced. Consequently, the lower lateral profile of the muzzle is described by the lips only in their lower-lateral-forward part, while farther back, toward the commissure, it is delineated by the mandible and by the commissure itself the pigment of the lip edges must be black. robust, with normal development and meeting in perfect scissor bite; the back part of the upper incisors should fit snugly over the front side of the lower incisors. The upper line of the lower jaw is nearly straight; teeth should be white, regularly aligned, and compete in development and number. The teeth pictured left are unevenly spaced. The teeth pictured right display a good scissor bite. the eyes are not large, considering the overall size of the dog. They should neither be deep-set nor protruding. They are ochre or dark brown in colour. The eyelids must fit fairly close to the eyes. The eye slit is almond-shaped. Pigmentation of the eyelids must be black. The direction of the axes of lids (that is, the straight line which passes between the two corners of the eye opening) determines a 30 degree angle with the median plane of the head. All these eyes are NOT correct. This whole head is incorrect. Eyes are round and set wrong. Shape and angle is crucial for expression! Close up of the maremma eye. This eye is almond shaped, but a little too round. The colour of the eye is beautiful. Here is the melting maremma expression we aim for. considering the size of the dog, the ears are rather small, they are V shaped, set on considerably above the zygomatic arch, and are covered with hair. The tip should be sharply pointed and never be rounded. Ear length in an average sized dog should not be more than 4 1/2 inches when the dog is completely in repose, the ears hang down at the sides of the head, but whenever the dog is alerted the ears are very mobile and should rise to a semierect position: This is indicative of the Maremma's talents as a guard dog and is a specific trait of the breed. The ears may be clipped to a certain extent, if the dog is to be used as custodian of a flock. These ears are NOT correct. Ears set high on the head and forward over the face. Not only incorrect ears, but very round eyes also. Ears set high on the head and too large. Ears too large and set high on the head. Very large ears set too low on the head. Small ears but rounded tip. Very large ears, rounded tip, set at correct height. Ears large and long, set low. Small V shaped ear set correctly. Strong, with long thick hair which forms a collar, there should be no dewlap. The length of the neck measured from the nape to the edge of the withers should not be more than 8/10 of the length of the head, and is almost 3.2/10 the height of the withers. The shoulders should be long, sloping, strongly muscled, and very free in movement. The length is about 1/4 of the height at the withers, while the slope varies from 50 - 60 degrees from the horizontal. the points of the scapulae are relatively vertical in respect to the medial plane of the body and therefore fairly well apart. well joined to the body in the upper two-thirds, with strong muscles, sloped at 55 - 60 degrees from the horizontal. Its length at the withers and its direction are nearly parallel to the medial plane of the body. well boned, vertical. Its length is slightly more than the length of the humerus, and measures slightly less than 1/3 of the height at the withers. The height at the elbow is 52.87% of the height at the withers. The elbows, which are normally close to the body and covered with soft, loose skin, should lie on a plane which is parallel to the medial plane of the body. The point of the elbow should lie on a perpendicular from the scapular. the wrist lies on the vertical of the forearm; lean, smooth, with no visible bone relief, except at its back edge, where the pisiform bone protrudes. seen from in front, the pastern follows the vertical line of the forearm, it is lean with a minimal amount of subcutaneous cellular tissue. Its length should not be less than 1/6 of the height of the entire member at the elbow. Seen in profile it should be slightly extended. large, rounded, with toes well closed, and covered with short dense hair. The pads are lean and hard; the nails are strong and arched. The pads are strongly pigmented, as are the nails, the pigment should be black (brown in the nail is acceptable). The length of the body, measured from the point of the shoulder (Outer scapular-humeral angle) or from the manubrium of the sternum to the point of the buttock (posterior point of the ischium), is 1/18 greater than the height at the withers. broad and well open, with well developed pectoral muscles, the width between the lateral limits (the upper and forward edges of the arms) should be 25% of the height at the withers. The sternum should be level with the point of the shoulders. broad, descending to the level of the elbow, well rounded at the midpoint of the height. The cross diameter which is greatest at half of the height, diminishes slightly toward the bottom, so that the stern region is still broad. The ribs are well sprung, oblique, with well extended interrib spaces; the last false ribs are long, oblique and well open. The sternum is long: in profile its outline is that of a semicircle with a very broad chord, which ascends toward the abdomen. The circumference of the rib cage should be about 1/4 greater than the height at the withers, and its diameter should be at least 32% of the height at the withers, while the depth of the rib cage should be 50%. In a dog 27 inches high the rib cage should have the following dimensions: circumference (behind the elbows) 32.6 inches; circumference on the rib arches 28.7 inches; depth 13.4 inches; height 12.8 inches. The thoracic index, therefore, should not exceed it (and should be preferably less). the withers are slightly raised above the backline, with the points of the scapulae set well apart. The upper outline of the back is straight. The length is about 32% of the height at the withers. its lower line, from the stern forward, rises very slightly toward the flanks, in such a way that the belly is slightly drawn up. The flanks should be of a length which is almost equal to the lumbar region; the hollowing of the flank should be minimal. broad, robust, muscular; the cross diameter between the haunches should be 1/7 of the height at the withers. Its length is 1/3 of the height at the withers. Its slope, from the haunch to the set on of the tail, is 20 degrees from the horizontal, and thus the dog's croup is hollowed. the male should have perfect and complete development of the testicles. set on low, because of the followed croup, when the dog is standing in normal position, the tail passes the hock. In repose it is carried hanging down, while when the dog is excited it is carried at the backline, with the tip slightly curved. It is well feathered with dense hair, but there should be no fringe. long, broad, covered with powerful muscles, with the back edge slightly convex. Its length is 1/3 of the height at the withers. Its outer face, from one edge to the other, should be 3/4 of its length. Its direction is slightly sloping form above to below and from the back forward, and, in respect to the vertical, it should be parallel to the medial plane of the body. well boned, and well equipped with lean muscles. The length is slightly less than the length of the thigh, and is 32.5% of the height at the withers. Its slope is about 60 degrees from the horizontal. 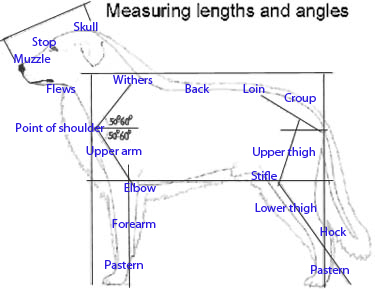 its height is 30.9% of the height at the withers; this means that in a dog 26 3/4 inches high, the height of the hock should be about 7 1/4 inches. The sides of the hock are very broad, its forward angulation is quite closed, seen from behind, the backline which goes from the hock to the ground should be on the vertical and on the prolongation of the buttock line. robust and lean; its length depends on the height of the hock. Seen from behind as well as in profile, it should always be vertical. There should be no dewclaws. solid white, Ivory, pale orange, pale lemon shadings are acceptable if not excessive. The pace is long, as is the trot. Same maremma in full flight but now in the extension stage of the movement - this dog is chasing a sighthound! General Characteristics: undistinguished overall appearance, light bone, lack of symmetry. Head: convergent cranial facial axis (a very serious fault). Nose lower than the line of the bridge; protruding on the vertical of the forepart of the nose; small; nostrils not well open; deficient pigmentation. Total de-pigmentation a disqualification. Bridge: short, narrow, with the sidelines exaggeratedly convergent; convex (arched); a pronounced arch or hollow constitutes a disqualification. Muzzle: short, exaggerated convergence forward of its sides, that is, a decidedly pointed muzzle. Jaws: thin; overshot condition if it harms the general appearance of the muzzle, undershot condition if due to lack of length in the mandible is a disqualification; if it is the result of bad direction of teeth it is a fault. Curved lower jaw; Irregular teeth; teeth lacking; horizontal erosion of the teeth. Skull: small, short, flat on top, or exaggeratedly rounded; broad at the zygomatic arches; masseters overly developed; underdeveloped sinuses; or (a serious fault) overly developed, to the point where the stop is pronounced. Convergence of the cranial facial longitudinal axis. Eyes: too small, or prominent; light eyes; walleyes (disqualification). Eyes set too high, round, entropion; suspicious expression; cross eyes. Partial depigmentation of the eyelids, or (disqualification) total depigmentation. total bilateral depigmentation of the eyelids (disqualification). Ears: too long or too short; semierect or rose ears. Set on low, rounded tips, covered with excessively long hair, not mobile. Neck: thin, too short; presence of dewlap. Pastern: short, thin, spongy; too long, too extended or straight; out of vertical. Foot: (Forefoot) fat; splayed, broad, too big, crushed; deficiency of arching in the toes; foot carried in or out, that is, not vertically. toe pads fleshy, thin sloes; deficiency of colouring in nails and pads. Bad positioning of pads. Body: too long; longitudinal diameter equal to height at the withers. Chest: narrow, insufficiently let down; poor muscular development; manubrium of sternum positioned too low. Back: short, interruption of the backline at the eleventh vertebrae. Saddle back (Lordosis); carp back (Hyphosis). Belly: drawn up; long and hollowed flank. Croup: narrow; deficient in length ; horizontal. Tail: too long or too short; lack of brachyurism, either congenital or artificial (disqualification); tail set on high. Tail curled over the back (disqualification), or with decided fringes. Thighs: short, or with badly developed muscles, that is, flat, deviated from the stifle; too straight or too sloped. Leg: light bone; short, insufficiently sloped. Hock: high; not broad; open or closed angulation; out of vertical. Metatarses: long, thin; out of vertical; dewclaws (a very serious fault). Dewclaws. Notice how they protude from the leg. These are very easily damaged, and this is very painful for a dog. They should be removed at a few days of age. Hair: strongly waved, curly (disqualification); short; lack of winter undercoat; hair too harsh or too soft. Colour: other than solid white; Isabella coat (disqualification); Isabel or ivory markings, even if very small, with sharp edges (disqualification). Ivory or pale orange tints in abundance. Skin: thin or too thick, over abundance; dewlap; traces of depigmentation on the nose and on the edges of the eyelids; lack of colouring, even if season; total depigmentation of the nose (disqualification). Height: more than 30 inches at the withers and more than 3/4 inch less than the minimum height standard. Head: decidedly convergent cranial facial axis. Bridge: concave or exaggeratedly arched. In judging, if any characteristic vital to the type of the breed is graded, the dog cannot be considered, but will be disqualified even if the other characteristics are all graded excellent.